Epic® Epoxy Thinner is a clear, water-like liquid that will lower the viscosity of Smooth-On casting and laminating epoxies. Epic® can be added in different proportions to an epoxy system and improves flow-ability, making it easier to mix and pour. Epic® will also aid in reducing bubble entrapment. 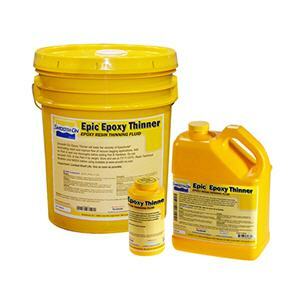 Epic® Epoxy Thinner IS NOT A SOLVENT, is not hazardous and contains no VOC’s or phthalates. Solvents that are commonly used to thin epoxies cause shrinkage. Epic® is 100% reactive fluid, does not evaporate and does not cause shrinkage. Epic® also facilitates higher filler loading and gives better wetting and impregnation. PREPARATION - Store and use all materials at 73°F / 23°C. Avoid breathing fumes - use in a well ventilated area at minimum. NIOSH approved respirator is recommended. Wear safety glasses, long sleeves and rubber gloves to minimize skin contact. USAGE - Epic® Thinner is added by weight. A gram scale is required. 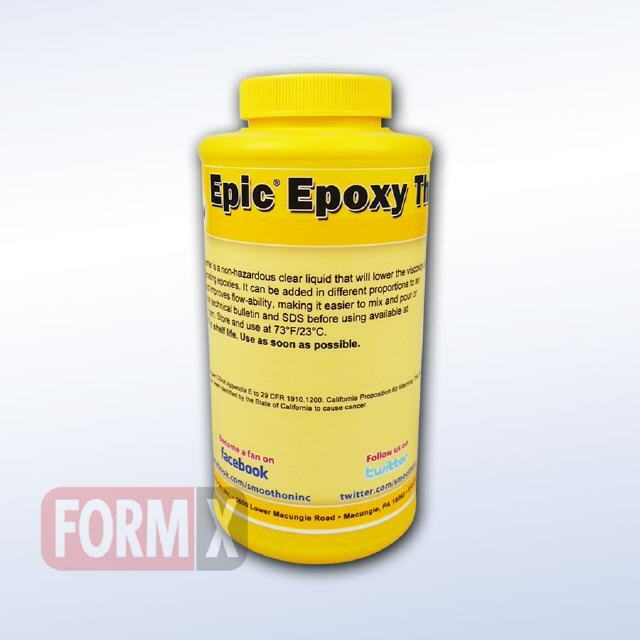 Read and follow directions given on the technical bulletin for the EpoxAcast® or EpoxAmite® product before adding Epic® Thinner. Important - Physical and performance properties (including Shore hardness) of cured epoxy system may be lower in proportion to the amount of Epic Thinner added. Do not exceed recommended loading maximum of 10% of epoxy Part A, as the epoxy system may not cure. A small scale test is recommended if outcome is uncertain.